The new Middle East online editor for BBC News has been praised by a pro-Israeli website for being “willing to listen to his critics” after he sent internal emails guiding BBC staff to write more favorably about Israel. Raffi Berg was promoted to head the BBC website’s Middle East desk earlier this month, having already worked as a journalist with that desk. His emails, which have been posted on a pro-Israeli site, were sent during Israel’s eight day assault on Gaza in November 2012, which killed nearly 200 Palestinians. In a second email, sent during the same period, Berg told BBC journalists: “Please remember, Israel doesn’t maintain a blockade around Gaza. Egypt controls the southern border.” He omitted to mention that the UN viewed Israel as the occupying power in Gaza and has called on Israel to end its siege of the Strip. Israel’s refusal to do so is a violation of UN Security Council Resolution 1860. Berg wrote in both emails that the advice was being given to BBC journalists as a result of complaints that the BBC was too harsh on Israel in its early coverage of the assault. In an email exchange earlier this week with a British-Palestinian activist, Berg said he was not responsible for posting the internal emails onto Biased BBC but accepted they were his work. The email exchange has been seen by the Palestine Solidarity Campaign. In a later email, the activist pointed out that neutral sources agree that Israel’s assassination of Hamas commander, Ahmed al-Jabari, was the trigger for the assault which followed, and asked why Berg was requesting BBC journalists to take the emphasis off this fact. In the days preceding the execution of al-Jabari, Israel killed seven Palestinians in Gaza, including five teenage boys, in the space of 48 hours. The killings reveal the scale and regularity of lethal Israeli aggression in Gaza. But rather than dwell on this, BBC journalists stuck doggedly to the line, pushed by Berg, that Israel’s eight day pounding of the blockaded Strip involved Israel defending itself. Berg has replaced Tarik Kafala as head of the online Middle East desk. Overseeing his work will be James Harding, who was appointed the BBC’s director of news and current affairs earlier this year. He and the openly Zionist Harding should get on well. Damascus – Syrian President Bashar al-Assad refuted Western allegations that his regime used chemical weapons on Damascus suburbs last month. In an interview with French daily Le Figaro, Assad warned France and United States of “negative repercussions” should they resort to military actions against his regime. Meanwhile, a declassified nine-page intelligence report released by the French external and military services suggests Assad’s forces behind August 21 chemical attack on Damascus suburbs of eastern Ghouta. The report alleges the strikes were targeted at rebel zones, referring to “massive use of chemical agents” involved in the attack. Further, the report alleges Bashar al-Assad’s forces staged at least three chemical attacks since April. The areas include towns of Saraqib and Jobar in April where at least 280 people were killed. Following a call by the US for a military strike in Syria, French President Francois Hollande backed a punitive response to the Aug. 21 chemical attack. However, after Obama stalled an immediate strike and placed a request for authorization from the Congress, France too backed out saying it has no intentions of acting alone and intends to create a coalition for intervention in Syria. Russia, which remains a staunch supporter of Assad, along with Iran, dismissed Western evidence of Assad’s role in gassing Syrian civilians. Further, Russian President Vladimir Putin proposed to send a delegation of Russian lawmakers to the US to discuss the Syrian crisis with members of Congress, the Washington Post reported. The Obama administration so far has failed to build a cohesive international coalition in support of military action against Syria. The British parliament voted against the military strike despite support by Prime Minister David Cameron. The Arab League is divided on this issue— countries like Egypt, Iraq, Lebanon, Tunisia and Algeria are not in favor of military action. Only France remains on the side of US if it decides to launch missiles in Damascus. RAMALLAH – The Palestinian Ministry of Detainees and Ex-detainees on Saturday said that the Israeli Prison Service (IPS) transferred eight Palestinian prisoners to solitary confinement for participating in a hunger strike in solidarity with their comrade. Karim Ajweh, the ministry’s lawyer, said that the eight prisoners were transferred from the Ishel prison to solitary confinement in section 12 in the Asqalan prison. Ajweh said that the 8 prisoners have been on hunger strike since August 25 in solidarity with Palestinian prisoner Dirar Abu Sisi. Abu Sisi has been on hunger strike for the twelfth day to protest against his continued solitary confinement and medical negligence. He is s suffering from heart, kidney, gallbladder and eyes problems. The ministry’s lawyer said that the prisoners decided to continue with their strike after the IPS refused to end Abu Sisi’s solitary confinement. On late July, the Ahrar Center for Detainees Studies and Human Rights prisoners’ rights said that Abu Sisi is the sole Palestinian held in solitary confinement in Israeli jails. The right’s center said that Abu Sisi, the director of Gaza Strip’s only power plant has been in solitary confinement since two years in Ishel prison. The center added that Abu Sisi was having difficulties recalling language, and was exhibiting health problems due to the detention conditions. It added that solitary confinement was taking its toll mentally on the prisoner. According to the center, the Israeli Prison Service confiscated his notebook and gives him rotten food. The center said Abu Sisi was the only prisoner who was excluded from the Egypt mediated between Israel and Palestinian armed-groups, including Hamas, by which Israeli authorities vowed to end prolonged solitary confinement. The deal, signed in May 2012, was made after Palestinian prisoners had launched a hunger strike, but Abu Sisi was nevertheless kept in an isolation cell, seeing as he was charged with developing Hamas’ rocket capabilities, as part of his position as the technical director of the Gaza electricity plant. Abu Sisi went missing on a train traveling in Ukraine with his wife on February 2011 and later was revealed to be at the Israeli prison of Shikma, to the south of Tel Aviv. Israel said at the time that Abu Sisi had information about Gilad Shalit, the Israeli soldier captured by Hamas near Gaza in 2006 and was released in 2011 in exchange with 1,027 Palestinian prisoners. The former Israeli Defense Minister Ehud Barak said that the Palestinian engineer has inside information on Hamas, not only on the matter of Shalit, so for this reason his detention is justified. Abu Sisi denies the allegations against him. According to the recent Palestinian statistics, Israel is holding 5,100 prisoners in 23 prisons and detention camps in Israel and in the West Bank. Palestinian President Mahmoud Abbas insists that prisoners must be freed in line with to the peace agreements reached with Israel. Gaza, Alray – Palestinian prisoner Hisham El-Shaer from Khanyounis southern the Gaza Strip, sentenced eight years in Nafha Prison, ended his hunger strike after the Israeli Prison Service(IPS) pledged to let him conduct a surgery in his eye. The prisoner’s mother told Alray on Sunday that her brother signed a deal with the IPS to end his strike in return for conducting an operation in his eyes during this month. Director of Mohjat Al-Quds Foundation Yaser Saleh praised El-Shaer and described his victory as being a national achievement, adding,” by their determination, prisoners smashed several policies practiced against them by the IPS including the solitary confinement, family visits, medical negligence and administrative detention. El-Shaer launched his hunger strike last month but the IPS ignored his demands and retreated its promises to let him make a surgery, according to Mohjat Al-Quds Foundation. Islamic Jihad militants take part in the funeral of their comrade Mahmoud Shaath in Khan Yunis, in the southern Gaza Strip, Nov. 28, 2012. Palestinian Islamic Jihad has warned that it may respond if Israel enters any war in Syria, as expectations rise of a possible US strike on Syria. A high-ranking official from Islamic Jihad told Al-Monitor that — upon request from Iran and Syria — Islamic Jihad may lob rockets at Israel if the events develop toward an all-out war against the Syrian regime and if Israel enters the war. The source said that the strike’s nature and details in terms of its quality and duration will determine Islamic Jihad’s position, given that the second-largest Islamic movement in Palestine still maintains close relations with the Iranian and Syrian regimes as well as with Hezbollah. “Islamic Jihad’s leadership has currently no significant presence in Syria, but there are still financial and political links. Hezbollah’s position toward the war could negatively or positively affect whether Islamic Jihad will participate,” the source relayed. Some Al-Quds Brigades elements said that, if permitted, they will fight in Syria alongside Hezbollah elements against any external force threatening the Syrian regime. “We hope that the border is opened so that we can travel to Syria to participate in repelling any Western aggression on Syria, to which we are grateful for allowing many of our elements to train on its land,” Al-Quds Brigades elements deployed on the Gaza-Israel border told Al-Monitor. Sheikh Nafez Azzam, a member in the Islamic Jihad’s general political bureau, said that Syria does not need Palestinian fighters to participate because Syria already has enough capabilities and that Palestinian elements participating in that war will not affect the power balance. Islamic Jihad sources told Al-Monitor that Iran pays the group about $3 million a month. Hassan Abdo, a political writer who is close to Islamic Jihad, believes that whether Islamic Jihad will respond to a US strike on Syria by attacking Israel depends on the nature and size of the US attack. “The Al-Quds Brigades will not try to portray its shelling of Israeli towns as a response to the attack on Syria because there are many other justifications it can use, such as the Israeli aggression on the Palestinians in Jerusalem, the West Bank and the Gaza Strip. The Al-Quds Brigades doesn’t wish to embarrassHamas, which is trying to stay away from a confrontation with Israel,” Abdo continued. Islamic Jihad figures whom Al-Monitor spoke with denied that their group would participate in a war against Syria, be it in Gaza or elsewhere. The group’s media, however, openly supports the Syrian regime against its opponents. With the acceleration of the events regarding Syria and the possibility of a US military strike, Islamic Jihad’s leadership does not seem enthusiastic about getting involved in a regional war that is greater than what the group can bear. Political interests, however, may play a role in changing that attitude and draw the group into a confrontation with Israel as well as with Hamas, which controls the Gaza Strip and is trying to stay away from a new military confrontation. Iran’s Defense Minister Brigadier General Hossein Dehqan says Tehran had given the US information about the import of a chemical nerve agent to Syria by militants eight months ago. “Therefore, [the US] wants [to launch] limited strikes in order to rebuild the shattered morale of terrorists [in Syria], weaken the operational capability of the Syrian armed forces and change the balance of operation in the favor of Takfiris,” he added. He said that the US currently does not have the necessary operational capabilities to use military force and create strategic balance in Syria. The Iranian minister said US disregard for international demands to avoid violence and militarism and use approaches based on dialog and reconciliation to settle crises prove that peaceful and reconciliatory slogans of the US officials lack truth. US President Barack Obama said on Saturday that he had decided to launch a military attack against Syria for its alleged use of chemical weapons and now seeks congressional consent for the move. Lawmakers will debate the issue upon return from recess on September 9. The call for military action against Syria intensified after foreign-backed opposition forces accused the government of President Bashar al-Assad of launching a chemical attack on militant strongholds in the suburbs of Damascus on August 21. Damascus has vehemently denied the accusations, saying the chemical attack was carried out by the militants themselves as a false-flag operation. NATO General Secretary Anders Fogh Rasmussen gives a press conference on Sept. 2 in Brussels. BRUSSELS (AFP) — NATO head Anders Fogh Rasmussen said Monday he is “personally convinced” that Syrian President Bashar Assad used chemical weapons near Damascus last month. “Personally, I am not only convinced that a chemical attack has taken place … I am also convinced that the Syrian regime is responsible,” Rasmussen said when asked if he had seen intelligence to prove Assad was behind the suspected attack which left hundreds dead. “In general, we have concrete information,” he said. Rasmussen stressed repeatedly that the international community could not allow the use of chemical weapons go by unchallenged but he was guarded about any military response. “The aim of the response should be to send a very clear message … that you cannot do that without a very firm international reaction,” he told a regular news conference. It would be up to NATO’s 28 members, led by the United States, to decide what specific military response they might make, he said. “I don’t envisage any further NATO role” beyond providing a forum for consultations and backing up member Turkey which shares a tense border with Syria, he added. Earlier this year, NATO deployed Patriot anti-missile batteries supplied by the United States, Germany and the Netherlands to help defend Turkey after border villages were hit by fire from inside Syria. The Patriot missiles have a deterrent effect, Rasmussen said when asked about a possible change in NATO’s stance if Syria were to retaliate against Turkey for a US strike. “An attack on one ally is an attack on all,” he said, recalling NATO’s core rationale and mission. Western powers face considerable public reluctance to get involved in another Middle East conflict and US President Barack Obama is trying to drum up Congressional backing for his plans to punish Assad. Britain has backed out of any military commitment after a parliamentary vote last week blocked efforts by Prime Minister David Cameron to join US forces in military action, leaving France the only major European country still committed to a strike. EL-ARISH, Egypt (Ma’an) — Egyptian forces have demolished six tunnels and 20 homes near the Gaza border since Sunday, an Egyptian security official said Monday. Twenty homes near the border have been destroyed, he added. The official said Egyptian forces had destroyed over 350 smuggling tunnels since the army deposed Islamist President Mohamed Morsi in early July. Egyptian forces have tightened control of Rafah, a town that straddles the Egypt-Gaza border, as well as the waters by the border to prevent smuggling by sea. Egypt’s navy has deployed lightly-armed warships off the coast of the border and banned fishing near Rafah and Sheikh Zuweid. A senior Egyptian military official said Sunday that Egypt plans to impose a 500-meter buffer zone along its border with the Gaza Strip. Egyptian residents living in Saladin, al-Barahmeh, Canada, Brazil, al-Sarsouriya and other neighborhoods close to the Gaza border have received eviction notices. Homeowners who received eviction orders demonstrated against the decision and burned tires in protest. Army bulldozers have also uprooted trees in the border area. 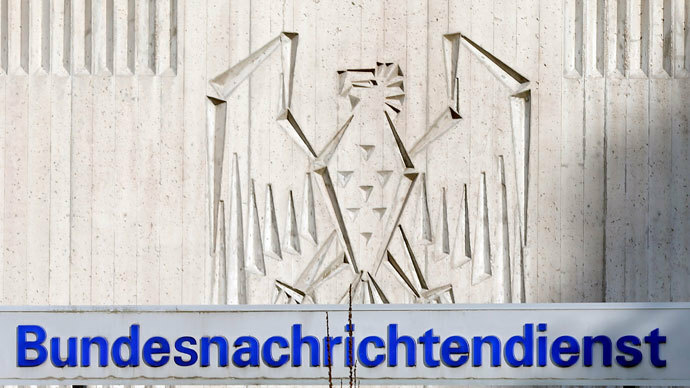 The main entrance of Germany’s intelligence agency Bundesnachrichtendienst (BND) headquarters is pictured in Pullach. The German intelligence agency has enough evidence in its possession to conclude President Bashar Assad ordered the suspected chemical attack in Syria, Germany’s Der Spiegel reports, quoting the results of a secret security briefing. The BND’s President Gerhard Schindler voiced his support for US allegations Syrian President Bashar al-Assad‘s government ordered the attack on the eastern Damascus suburb of Ghouta on August 21, Der Spiegel reported Monday. The intelligence agency’s chief said that following a thorough analysis his ministry assumes that the regime is the perpetrator of the chemical attack which killed hundreds of people. Schindler reportedly said in the meeting only the Syrian government were in possession of such agents as sarin. The agency’s experts concluded it was used in large amounts in the Ghouta incident resulting in massive fatalities. Sarin is a neurotoxic gas, high doses of which can lead to paralysis, loss of consciousness, convulsions, respiratory failure, and eventually death. According to Der Spiegel, a reason behind Assad’s decision to deploy the gas was that this was a crucial battle for the capital where the agent might have been meant as a deterrent against rebel forces, but mistakenly the military used too much of it. In further conclusions, the BND said only Syrian government experts could mix sarin and place it inside small rockets. The process reportedly took place several times prior to the alleged attack which sparked the investigation. The BND apparently cited new evidence to conclude the agent used was sarin, having intercepted communications between a high level Hezbollah official and Iran’s embassy. In the tapped call, a doctor described details of patient symptoms specific to exposure to the internationally outlawed gas. The German intelligence agency was surprised to hear the Hezbollah official saying that Assad had snapped, and had made a big mistake in going through ordering the use of poison gas. The Lebanese militant group has traditionally been viewed as Assad’s ally. Bandar bin Sultan, de spin in het web? Bandar bin Sultan (voluit: Prins Bandar bin Sultan bin Abdul Aziz Al-Saoed) is een politicus uit Saoedi-Arabië en hoofd van de Saoedische veiligheidsdienst. Vanwege zijn goede contacten met de familie Bush wordt hij ook wel Bandar Bush genoemd en recentelijk noemde een blogger hem in een zeer interessant artikel Bandar bin Israel. Maar daarover straks meer. Hij is puissant rijk en machtig en heeft goede banden met de veiligheidsdiensten van allerlei landen, inclusief de CIA. In zijn loopbaan van 22 jaar als ambassadeur in Washington heeft hij goede contacten gelegd met zowel het Amerikaanse als het Israëlische politieke en militaire establishment. De meest recente en tot nu toe ook meest aannemelijke verklaring voor de “gifgasaanval” in Ghouta is dat de “rebellen” chemische wapens hadden gekregen van Bandar bin Sultan. De mannen hadden echter geen enkele ervaring met deze wapens en ze zijn per ongeluk tot ontploffing gebracht. Een van de strijders zei zelfs dat ze helemaal niet wisten dat het chemische wapens waren. Met als gevolg uiteindelijk honderden doden. Dit komt ook overeen met wat Arnold Karskens al snel na de vermeende aanval bij Kneven & Van den Brink zei, namelijk dat er geen beelden van overdag waren, wat heel vreemd is natuurlijk, je zou denken dat er de volgende dag juist enorm veel informatie naar buiten zou komen. Daarnaast – en dat neem ik meteen aan – zegt Karskens dat een serieuze aanval met gifgas voorafgegaan wordt door conventionele bommen om ruiten te doen sneuvelen en gaten te slaan, zodat het gas later effectiever z’n werk kan doen. Ook daarvan was niets te zien. Artsen Zonder Grenzen houdt het op 350 doden, veel minder dan de meer dan 1000 waar Kerry en Obama mee schermen om hun aanval c.q. strafexpeditie te rechtvaardigen. Het verhaal kwam naar buiten via MintPress News, een onafhankelijke nieuwssite. De zeer ervaren journalist Dale Gavlak was betrokken bij het schrijven en de research, in samenwerking met de journalist Yahya, die ter plekke aanwezig was en sprak met artsen, rebellen, hun familie, slachtoffers van de chemische wapens en de lokale bevolking. Van de ondervraagde rebellen gaven een dozijn aan dat ze hun salaris ontvingen uit Saoedi-Arabië. Bandar bin Sultan wordt op handen gedragen door al-Qaidastrijders in Syrië. Naar buiten toe doet Saoedi-Arabië of het de gematigde rebellen steunt, maar in werkelijkheid zijn het juist de extremisten. Binnen Syrië vecht Saoedi-Arabië een strijd uit met Qatar, dat weer andere groepen steunt. Om een idee te geven van de macht van deze man is één voorbeeld voldoende. Bandar wilde Poetin, die zoals bekend Assad steunt, omkopen met goedkope olie. Als Poetin zijn steun aan Assad zou laten vallen, zou Bandar garanderen dat de Russische marinebasis in Syrië ongedeerd zou blijven. Mocht Poetin zich niet willen laten omkopen dan dreigde Bandar met terroristische aanslagen tijdens de Olympische Winterspelen in Sotsji, uitgevoerd door Tsjetsjeense rebellen. Poetin is hier niet op ingegaan, maar het moge duidelijk zijn dat we met een gewetenloze schurk te maken hebben. De enigen die zouden kunnen profiteren van deze gruweldaad zijn de rebellen. Aangezien de troepen van Assad overwinning op overwinning boeken is het in het belang van de rebellen om een interventie van westerse landen uit te lokken. En dat lijkt vooralsnog te gaan lukken. De moeder van koning Abdoellah van Saoedi-Arabië en twee van zijn vrouwen komen uit een invloedrijke, ultra-conservatieve soennitische clan in Syrië. Dat onderstreept de angst van veel analisten dat een overwinning van de rebellen zal uitdraaien op de overheersing van de talloze minderheden in Syrië door conservatieve soennieten. Deze grote vriend van de Verenigde Staten leidt nu een land waar dagelijks de mensenrechten worden geschonden en waar vrouwenrechten zo goed als afwezig zijn. De grote doorbraak van het Saoedisch feminisme kwam pas dit jaar: vanaf 2013 mogen vrouwen daar fietsen, zolang ze maar zijn vergezeld door een mannelijk familielid en ‘volledig eerbaar gekleed’ zijn. Ze zijn op de goede weg, zullen we maar zeggen. Sinds 2008, toen president George W. Bush, waarschijnlijk op zoek naar Oostenrijk, in Saoedi-Arabië terecht kwam, kan de relatie tussen het koninkrijk en de Verenigde Staten niet meer stuk. Officieel zijn de Amerikaanse troepen vanaf 2003 vertrokken, maar er blijven militaire bases aanwezig onder de eufemistische benaming trainingsfaciliteiten (USMTM). Eerder dit jaar bleek dat de Amerikanen al jaren een geheime vliegbasis voor drones hebben in Saoedi-Arabië. En in april van dit jaar bevestigde de Amerikaanse minister van Defensie Chuck Hagel dat er een overeenkomst voor wapenleverantieswas getekend met Israël, Saoedi-Arabië en de Verenigde Arabische Emiraten voor maar liefst 10 miljard dollar. De Amerikanen moeten een reusachtige glazen bol hebben. Hoe konden ze anders voorzien dat het zo uit de hand zou lopen in Syrië? De criminele achtergrond van ‘Bandar Bush’ gaat minstens terug tot de jaren tachtig van de vorige eeuw, toen hij het hulpje was van de CIA om Ronald Reagans “vrijheidsstrijders” in Afghanistan te bewapenen (de moedjahedien). Het is zeker dat Syrië geen ‘piece of cake’ is zoals Libië; zelfs toen hij op alle fronten verslagen werd hield Khadaffi het nog acht lange maanden vol vanaf het moment dat de NAVO begon met hun humanitaire bombardementen. Syrië heeft een weliswaar vermoeid, maar toch sterk leger van ongeveer 200.000 man; ze hebben enorme hoeveelheden Russische en Sovjetwapens; uitstekend luchtafweergeschut en de volledige steun van de experts in asymmetrische oorlogsvoering Iran en Hezbollah. Ik geniet altijd van de stukken van Sharmine Narwani. Zij schrijft heldere en grondige stukken voor al Akhbar en soms voor de Huffington Post over allerlei zaken die betrekking hebben op het Midden-Oosten. In Bandar ibn Israel onderzoekt ze wat de grootste gemene deler is van de Syrische onrust van de afgelopen jaren en de reactie van omliggende landen en het Westen daarop. De ontwikkelingen in de 20e eeuw die hebben geleid tot een sterker zelfbewustzijn van landen in het Midden-Oosten zijn niet voor iedereen even gunstig. De macht van de Verenigde Staten is nog steeds superieur, maar is wel aan het tanen. Daarentegen is een grootmacht als China steeds nadrukkelijker aanwezig. Israël kan in z’n eentje niet het hele Midden-Oosten in bedwang houden (wel vernietigen, maar dat is een ander verhaal) en dus moeten de Verenigde Staten – zeker gezien de ontwikkelingen van de afgelopen jaren – afwegingen maken waarbij olie en dominantie een grote rol blijven spelen. Er moeten dus “correcties” worden uitgevoerd om dat wat is scheefgetrokken door de ‘Arabische Lente’ weer recht te breien. En geen partijen zijn momenteel meer geïnteresseerd in het ‘corrigeren’ van het regionale machtsevenwicht dan het koninkrijk Saoedi-Arabië en Israël – beide staten raken steeds meer gefrustreerd door de apathische houding van hun westerse bondgenoten en de incrementele winst van hun rivalen Iran, Syrië, Hezbollah en tegenwoordig Irak. Nadat Bandar bij eerdere pogingen om zich te bemoeien met de gang van zaken in Syrië was teruggefloten door de koning, kreeg hij na het begin van de Arabische opstanden opeens toch groen licht. Het Saoedisch koningshuis zag een mogelijk ‘verlies’ van Syrië aan de opstandelingen als een ramp. Toen waren de opstandelingen nog gewoon het Syrische volk die in opstand kwamen tegen de dictatuur van Assad, de door de VS/Israël getrainde en bewapende jihadisten kwamen pas later. In 2012 werd Bandar dan ook benoemd tot hoofd van de beruchte Saoedische veiligheidsdienst Al Mukhabarat Al A’amah met z’n “myriaden connecties met de onderwereld van de globale jihad”. Aangezien de Amerikanen na Afghanistan en Irak wat minder nadrukkelijk aanwezig wilden zijn, moesten de Saoedi’s op zoek naar een nieuwe partner, eentje die niet zo kinderachtig was. Die partner moest Israël zijn. Wikileaks onthulde in 2007 dat volgens de Amerikaanse ambassade “Bandar Iran nu als een groter gevaar ziet dan Israël”. Het waren Saoedische diplomaten die begonnen westerse landen te bewerken met beweringen dat president Assad een “rode lijn” had overschreden. De enige belangrijke speler die bleef tegenwerken was Poetin, maar, zoals boven vermeld, het lukte Bandar niet hem voor zijn karretje te spannen. En het was Saoedi-Arabië dat het beruchte Al Farouq Battalion in Syrië steunde. De commandant die een gedode soldaat opensneed en een hap uit diens hart nam, was lid van deze exclusieve club. Israël voert geheime missies in Libanon uit. Als leden van een groep die gelieerd is aan al-Qaida vier raketten op Israël afschieten, neemt Israël geen wraak op hen, doch op de PFLP (Popular Front for the Liberation of Palestine). Het lijkt er op dat Israël net als de Saoedi’s een boodschap heeft voor Libanon: Hezbollah moet verdwijnen uit Syrië, anders zal Libanon de gevolgen dragen. Narwani ziet Bandar als iemand die zich door niets en niemand zal laten stoppen om zijn doel te bereiken. En met een handlanger als Israël is dat doel misschien wel dichterbij dan we denken. De escalatie van het geweld in de regio – van Libanon tot Irak – is momenteel voor een belangrijk deel een Bandar-Israël-project. En de plotselinge escalatie van militaire dreigementen uit Washington aan het adres van Assad is zonder twijfel het gevolg van pressies en beloningen waarmee dat duo zwaait. Indien belangrijke media het aandurven het verhaal van MintPress Nieuws (zie ook onderstaande video van infowars.com) de aandacht te geven die het verdient is het misschien nog mogelijk het tij te keren. Althans wat de Verenigde Staten betreft. Of Israël, gesteund door een generaal in Egypte en een koning in Saoedi-Arabië, overmoedig genoeg zal zijn om zelf het voortouw te nemen, blijft op dit moment gissen. Dat alle doden die al gevallen zijn in Syrië en die nog zullen vallen slechts een bruggetje vormen om tot Iran te geraken, geeft meer dan al het andere aan hoe de internationale politiek functioneert. Ik wilde zeggen onmenselijk, maar dat is het juist niet, dat is het ergste.